Hamilton teacher receives patriotic award - Hamilton School District. 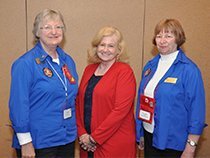 The Wisconsin Veterans of Foreign Wars (VFW) Auxiliary selected Hamilton High School special education teacher Mary O’Neil as recipient of its 2018 Patriotic Leadership Award. She was presented with the award June 14 at the state convention in Green Bay. The award is presented to teachers who develop and teach outstanding patriotic programs. The Pewaukee VFW Auxiliary nominated O’Neil for her work with summer school students and children in an afterschool daycare program that demonstrated exemplary teaching of citizenship, patriotism and American history and values. O’Neil’s students led a Fourth of July parade and distributed thank you notes to local veterans on Veterans’ Day. The Pewaukee VFW Auxiliary to Post 9537 nominated O’Neil for her commitment to partnering patriotism with education.